Discuss what Eisenhower meant by the “Military-Industrial Complex.” Why did the outgoing president feel the need to warn Americans about this? How justified were Eisenhower’s concerns? Was there any irony to this warning? Explain. 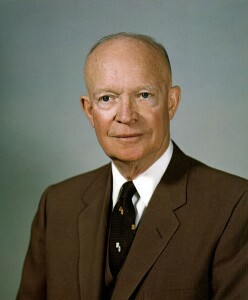 In his farewell address to the citizens of his nation, American President Dwight Eisenhower chose to dwell on one particular aspect of the American economic system. Those were the years following the Second World War and the United States was waging a cold war with the Soviet Union. As a result, a strong military had become imperative. Many ammunition manufacturing corporations sprung up in the United States to meet this demand. The only way such a large industrial base could survive is by creating more demands for ammunition, combat vehicles, etc. The military industry in America is so big that they can sway and influence the decisions taken in the executive branch of government. In effect, since the conclusion of the Second World War, the United States had seen a virtual “war economy”. Such an economic system can only thrive in an atmosphere of international tension and hostility, which is a bad result for humanity at large. Eisenhower was a shrewd statesman and an admirable leader (in the capacities of a General and a President). He understood this nexus between the weapons manufacturers and its employers in the American military. Eisenhower understood the vicious nature of this symbiotic relationship between a government agency and a commercial enterprise and warned his citizens to be wary of its consequences. In other words, he cautioned his fellow countrymen to mobilize themselves in curbing this negative development in post war America. Looking back at the recent history of American military intervention across the globe, one cannot stop wondering if those were the manifestations of Eisenhower’s nightmares. Furthermore, the general dissent and disapproval that the United States attracts in the third world countries is another indication of the military-industrial complex’s existence. What’s ironic about this message from Eisenhower is the fact that he himself was part and parcel of this military-industrial nexus.